Has anyone else heard of an Altered Book? My mom got me started on these and they are pretty cool. The whole idea is to take any old book and turn it into a piece of art, using craft glue, paint and just about anything else you can fit on a page. You can "alter" books, envelopes or pretty much anything, I imagine. I like to alter books because the final result is pretty amazing. Another really cool aspect of this art is that people all across the country enjoy it, too. 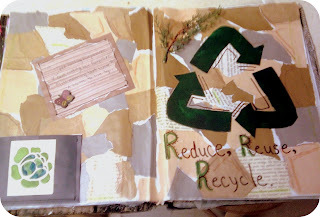 This means that anybody can join an "altered book" group and pick a theme for their book, and mail it around and have other people work on spreads in it. This results in a book, with a common theme, filled with work from all different artists with different styles. 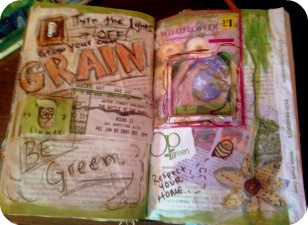 This spread on the top is my favorite, it is from a "Go Green" themed book "swap" I did through Yahoo Groups. All of the books involved had the same go green theme and these three spreads are ones I did. I used fabric, scrap book paper and paint to make this little windmill on a hill. Typically, I glue the pages together, about 10 or 20 in between spreads to support them and make an altered book with thick dividers between pages. 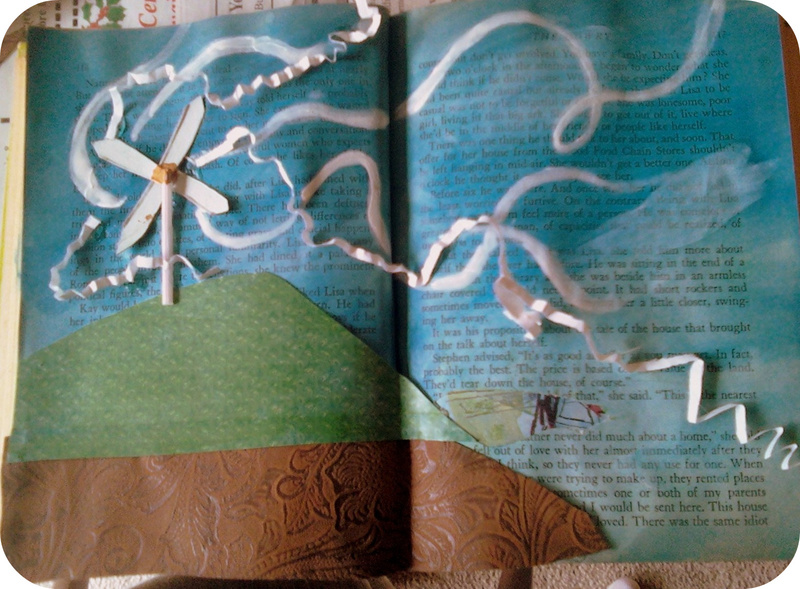 This allows you to cut into pages and see images on other pages that are glued in, like in this spread of the windmill. In this spread, I used recycled pieces of cardboard, newspaper and paper to make the background. I even used fake branches! I also got to use my sewing machine to sew a border around the paper with the butterfly on it. The stitches add a unique and unexpected border to the spread. Although this spread is simple, I definitely think it follows the theme and gets the message across. Speaking of going green, this is an entry I submitted for some Google contest. I didn't win or anything but, I still think it is kind of cool. It goes along with the " go green" theme, too. The "G" is supposed to represent solar power, the first "o" is corn powered gasoline powering a car that is driving around the second "o", the world, while the second "g" is water power, the "l" a windmill and "e" is the recycle symbol. 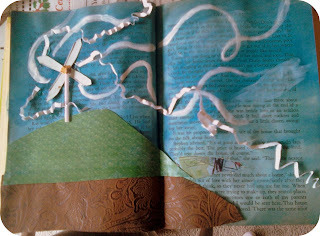 Anyway, I encourage all of you to look into altered books and try one of your own. They make great gifts.